Well, looks like we brought rain with us. 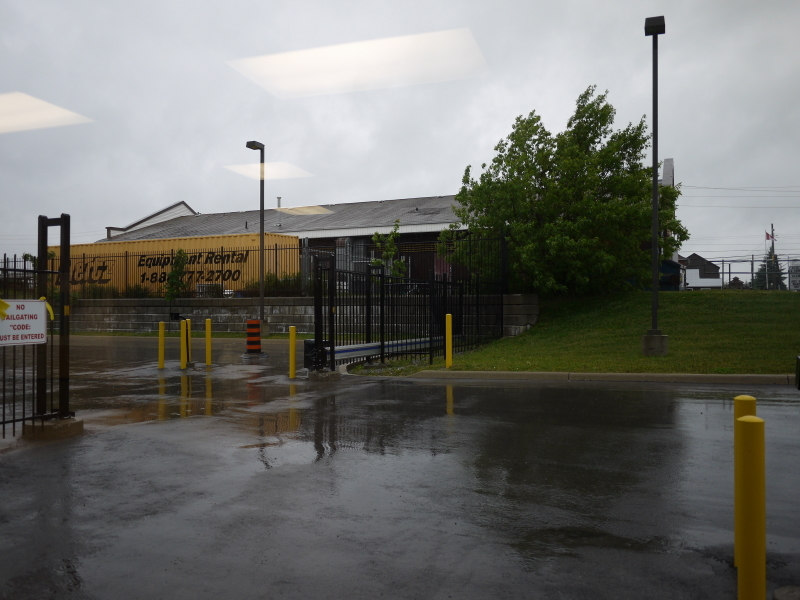 They have barely had a spittle of rainfall in Ontario since last November and, voila; we fly in and the heavens open. 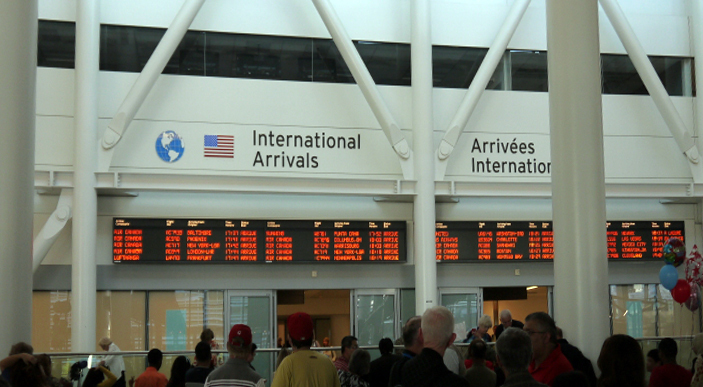 We arrived in Toronto at about 1830 last night. Clearing in was straightforward – none of the usual questions about why we were here, how long for etc. The airport shuttle arrived and picked us up at about 7pm and brought us the 70 km to Hamilton, where the bike is stored. 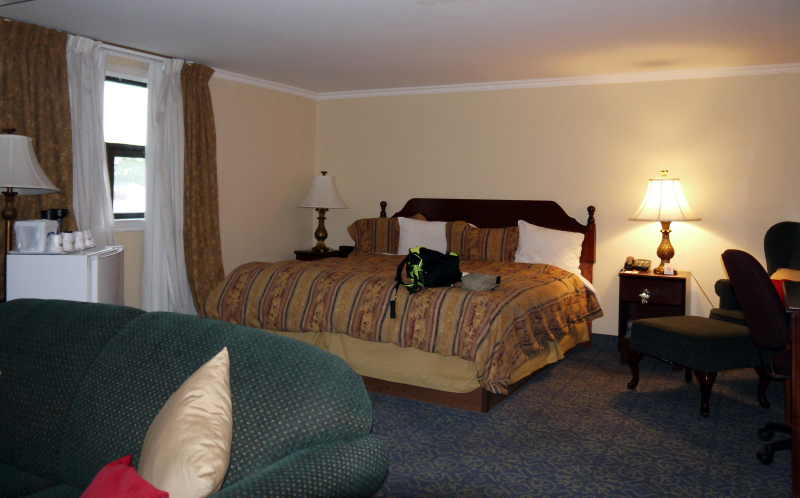 As a thank you for our loyalty in using this Howard Johnson hotel/motel, the manager had upgraded us to a suite – wooo! Our body clocks were still on British Summer Time and, despite the tiredness we felt last night, we were awake and raring to go at 4am this morning. 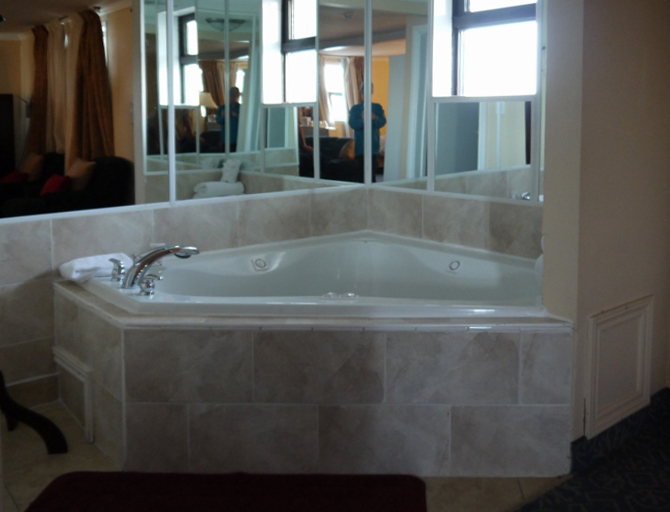 The jacuzzi sat in a corner trying to tempt me, but it was still a no-go; too much fun, far too early, so a functional shower did the job just fine. The breakfast area is open from 7am and we had a drink and a slice of toast – there were lots more foods to choose from, even waffles with maple syrup but it all seemed too much for my nervous constitution; my stomach was churning and twisting with the anxiety of riding the bikefor the first time in nine months and in rain and heavy traffic. Reception ordered a taxi to get us to the storage area – about 10 miles away. By now it was hammering down so I stayed in the office chatting to the lady there while Jan went to put the battery back on the bike and see if she would start. And she did. There were a few things to fasten up and check – oh yes, there were mouse droppings in the unit!. It’s a really tiny little container so it was a bit of a struggle to get changed into bike gear and – horror of horrors, my trousers only just fastened; ok, I did have jeans on underneath but, oh heck, I have been slobbing around too much over the winter. Hell’s Bells – I could only just get my leg up and over! I think I shrunk downwards and spread outwards in the land of pasties! Never mind, a few weeks of climbing on and off and I’m sure things will tighten up in certain directions and limber up in others; I hope so. Jan’s helmet leaks all around the visor; he has bought a new one, but it was delivered to friends in Ohio, so he has to make do with the leaky one for a few days. But it was steaming up very badly, so we made a detour to Walmart for some anti-mist stuff (and an International phone card to phone home). The mileage at the start of this trip is 44,554. Yep, forty four thousand, five hundred and fifty four miles all but 10 of which have been ridden in the USA or Canada.What a little belter of a bike! It will be an early start tomorrow – along the QE 402 to Windsor and across the Bluewater Bridge to the USA – entering at Port Huron. If that goes well, weather-wise, we will carry on to Lansing in Michigan to have a full service and all the oils and filters changed on Monday morning. Good luck to you both, enjoy your adventure. Just discovered your adventure and could not be more excited about reading your posts. 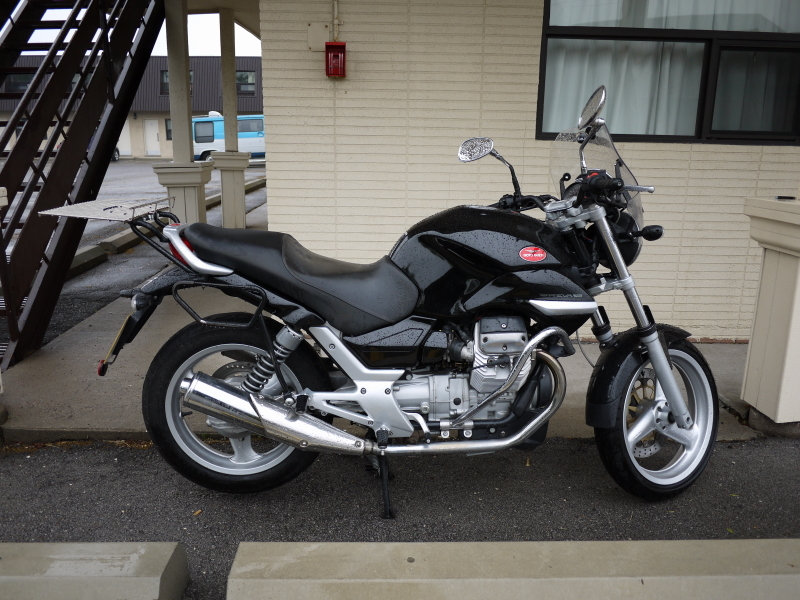 Wife and i just bought a 07′ Breva 750 and were wondering how bulletproof this bike could be…..i guess 40K + in miles says it all. ……look forward to reading all the posts. Congratulations on your new Breva. We are now up to 51,000 miles – two people, camping gear, camera equipment. laptop, tools, first aid ger – we are generally rather overloaded so you can tell, the Breva copes with everything we throw at it. \only 2 problems over the whole mileage and the first one was due to a bolt not tightened when the bike was manufactured. By the way, oceanluvr, for lots of help, advice and fun – you could join Squadra Guzzista. Not in the UK, live in Florida……but will check out the site nevertheless, thanks! Thanks for the leads, i have checked out and registered on both. BTW what brand of jacket is that? I think I read in one of your posts that it was a lightweight jacket..